InnoMedia’s MTA 6328-16 is a 16 voice port MTA device that offers broadband telephony service providers to deliver new revenue generating telephony services to their business customers (Figure 1). It can also be used in conjunction with an IP PBX as an enterprise IP-based PBX solution (Figure 2). The MTA 6328-16 has rich set of business features including ground start and loop start for business PBX’s, foreign voltage detection to allow house wiring and prevent accidental connection of house wires to live PSTN, T.38 and G.711 fallback for fax, and metering pulse for payphone applications. 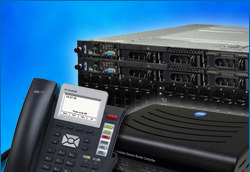 In addition to business friendly features, MTA 6328-16 also supports flexible auto-provisioning, remote manageability through InnoMedia’s Device Management System, and works with softswitches to offer a wide variety of call features including Caller ID, Call Waiting, Call Forwarding, Call Return, Caller ID Blocking, Call Trace, Automatic Callback, as well as device based 3-way calling.